Can I compress a DVD9 file from hard drive to a blank DVD5 disc? style="margin-left:20px">Can I compress a DVD9 file from hard drive to a blank DVD5 with Any DVD Cloner Platinum? Q: I have some DVD movies backup files on hard drive disc and they are DVD9 movies, they are DVD Folder or ISO Image File. I found Any DVD Cloner Platinum supports DVD Folder or ISO Image File as Input. So, can I burn DVD Folder or ISO Image File from DVD9 movie to blank DVD5 with Any DVD Cloner Platinum? 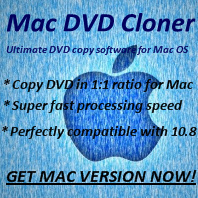 Yes, Any DVD Cloner Platinum supports burning DVD Folder or ISO Image File to blank DVD disc in 1:1 ratio.